Binance is the Best Crypto-to-crypto trading website, and it also offers the lowest fee each trading, there are many exchanges for Cryptocurrency trading but this one Is responsible and mobile friendly website. Binance.com was launched in 2018, The company based in Shibuya-ku Tokyo, This is the World Fastest growing Crypto-to-crypto trading exchange. it’s better then Bittrex, Kucoin, Poloniex at this time. Binance provide There are two options for trading First one is Basic trading and the second one is Advanced trading. There is not a huge difference between both of them but in the advanced version Shows Some extra options like your past trading history batter Chart and Good user experience. It accepts There are lots of cryptocurrencies including Bitcoin, Ripple (XRP), Ethereum (ETH), Tron (TRX), and More. For trading on Binance, you must have each currency in 5 recommended currencies Including BTC, ETH, USDT, and Binance Coin (BNB). First, you need to deposit each currency in recommended currencies then start to exchange with other currencies. 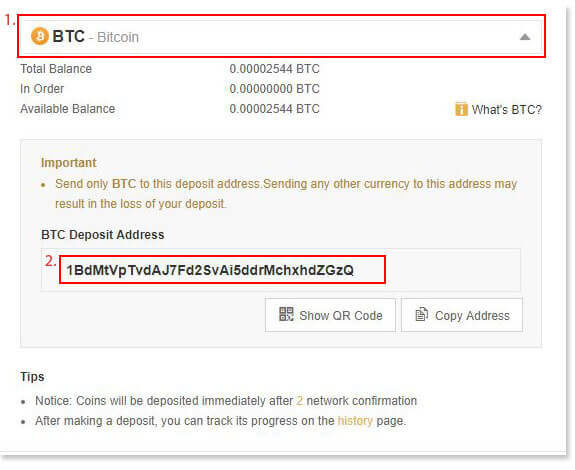 For Deposit fund in Binance find Deposit & withdrawals page clicking on Fund page then will show all currencies list select currency then copy the deposit address and send your Cryptocurrency to that address. The final step to exchange Cryptocurrency on Binance, click on Exchange option will show you full trading page. In trading page, Binance shows Live tradings, Price chart, and all basic details, for example, you will see there BTC to IOTA, BTC to ETH, USDT to BTC and more. First, choose each currency in required currencies Like BTC, BNB, ETH, USDT then chose a currency which you want to buy with your currency. Then will show you Buy and sell an option where you can buy and sell your chosen currency. Binance Also offers a Beautiful and useful crypto-to-crypto exchange application the app available for both Operating Systems in Android and IOS. The withdrawal fee regularly adjusted according to Blockchain conditions for Updated fee rates you can visit Binance fee Page. Binance also offers fee 75% off when you exchange any currency with BNB coin. Binance charge lovest trading fee, It charges 0.075 % each trading.